Can a laser pointer blind you? If you’re just learning about laser pointers, then one of the more common questions to ask is just how dangerous they are to your eyes. Whilst many regulations have been put in place to minimize the power output of laser pointers purchased online, this doesn’t mean that lower power pointers can’t damage your eyes at all. And you’ll still find people with more powerful laser pointers, so it’s important to know whether a laser pointer poses a serious threat to yours eyesight and others around you. Do I need safety glasses with my laser pointer? So, whats a good rule of thumb for timing? What about high powered lasers? 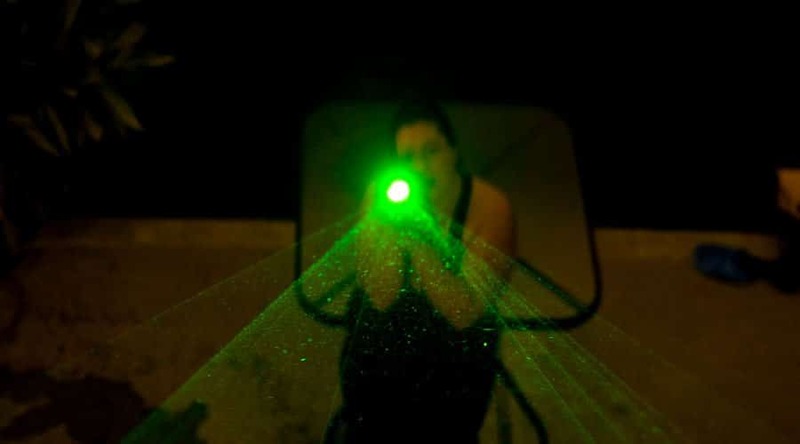 Are green laser pointers more dangerous for your eyes than red? Here, I’ll explain to you how a laser pointer isn’t something to play around with – even if it’s low powered. It’s recommended that you wear safety goggles for any laser pointer that’s above Class 3R. The way that laser pointer are classed are directly related to how dangerous they can be, or how ‘hazardous’. For example a Class 1 laser is non hazardous – Class 1 is the type of laser you’d find that reads your DVD player. A Class 4 laser would be considered an immediate hazard for your eyes, but Class 4 is very powerful – think industrial lasers and lasers used for research purposes. With laser pointers however, we’re often dealing with very different ranges of power output from a laser. The majority of lasers are Class 3R or lower, which is classified as ‘Momentarily hazardous’. You can find laser pointers that are significantly higher in power output than this, but you cannot purchase them legally online in the US. This means that for the laser pointers you can legally buy in the US, you don’t necessarily need to wear safety glasses. If you want to know more about this, check out my short guide to how lasers really work, which has the table on how you should classify a laser. So, if we are considered a laser that is Class 3R or less- this means that it’s less than 5 mW of outputting power – can this type of laser seriously blind you? Well, the answer is undoubtedly yes. If your laser just glances past your eye for a short period of time, then the likelihood is that this isn’t going to have an effect on you. But if you hold the laser at your eye or someone elses for a significant period of time, then this laser is more likely to do damage to your eye. What classifies as an extended period of time? Well, research shows that anything more than a quarter of a second will likely increase your chance of damage to your eye. And this research was undertaken with a laser that was only 1 mW, so it is assumed that if a laser is more powerful than this, then less time may expose our eye to more danger. Fortunately, your eyes have a natural reflex which makes them close within 0.2 seconds the majority of them time, so you’ll unlikely have to face a laser to the eye for a longer period of time than this. There’s no scientific research that says if you point an x powered laser pointer at your eye for x seconds, then that will render you blind. However, there has been some research done and I’ll give you my opinion. For a low classification of laser pointer – classes 1 and 2 – you’d really need to point the laser at your eye for many seconds. In this time, you’re likely going to close your eyes, which is a natural reaction to getting hit in the eye with bright flashes. In fact, even if you’re hit in the eye with a Class 3R (5 mw) laser for a few seconds, you’re unlikely to experience any permanent retina damage. The most that you are likely to get in terms of damage from a lower class laser pointer is flash blindness. Flash blindness is essentially just where you get temporary blindness due to the high intensity of the light flashing in your eyes. This is pretty common. Now, if you hold a laser to your eye for more than a few seconds – this can be a 1 mW or a 5 mW laser – then it does have the opportunity to damage your retina. Whether or not this will be temporary or permanent is unknown – the majority of times retina damage is temporary, but there are cases of where retina damage has been permanent. But, it isn’t likely to blind you completely (though it is theoretically possible). There’s a reason that experts recommend that you were laser safety glasses when dealing with Class 3M and 4 lasers (Class 3M means anything from 5 mW-500mW, and class 4 is anything above that). These lasers have the ability to permanently blind you. If you use laser pointers that are in excess of 5 mW and anywhere into level 4 categories, then you need to be completely safe with this type of laser. These lasers have the ability to burn, so it’s not hard to figure out that they could permanently impair your vision. The short answer to this is yes, they are. This is quite simply because your retina will more easily absorb a green laser than it will a red laser. This makes your retina far more vulnerable to a green laser than a red laser. The real danger with laser pointers is aiming them at moving vehicles and causing flashblindess in the operator. This is far more of a risk and far more reported injuries than permanent eye damage and blindess. Whilst you might think that the chances of you hitting a pilot or driver in the eyes is very low when pointing a laser at a vehicle, this isn’t the case. Often the windscreen of the vehicle will actually amplify the laser beam, which will completely cover the operators view. This is one of the main reasons that higher powered laser pointers have been restricted. In conclusion, it’s easy to see that high powered laser pointers can in fact blind you. Lesser powered laser pointers may have the ability to blind you, but research is far less conclusive than with Class 3M and 4 laser pointers. They do have the ability to damage your retina however, so you should take care no matter what power output laser pointer you are using.